Chocolate Hills Natural Monument is part of the Tentative list of Philippines in order to qualify for inclusion in the World Heritage List. After the 2013 Bohol earthquake, the Loboc church and the Spanish colonial fortifications of Punta Cruz and Dauis were removed from the UNESCO tentative list. Panglao Island was also removed because the planned international airport is thought to compromise the biological diveristy of the place. Hence, the once potential "Heritage Complex of Bohol Island" was reduced to only two properties - the Chocolate Hills and the Anda, Bohol petrographs. 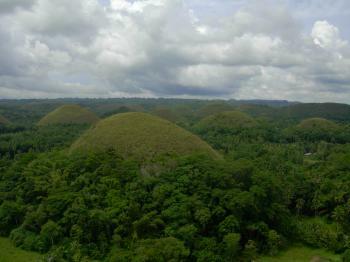 No doubt about it, the Chocolate Hills is a geological wonder! At any angle, it commands attention. In 2012, two friends and I visited the park. While the view deck is a "must visit" spot, the chat with a local farmer living at the foot the hills was the highlight. He said he grew up inside the geologic park, as a kid would run up and down the hills with his friends during summer (when the hills are Hersheys chocolate brown). He even claimed to have burned a whole hill for "fun." Whether or not the Chocolate Hills will soon be nominated for inscription is IMO, no big matter. It is already and will always be one of the Philippines' icon, a natural gem. Definitely a must-see. I went here last November 2011. The Chocolate Hills are truly a world wonder. This hills are actually coral limestone-karst domes, believed to be underwater millions of years ago but have been uplifted to the surface due to tectonic movements. There are two places to go to in order to have the best views of these famed national geological monuments: Sagbayan Park or the Chocolate Hills Viewdeck. Entrance fee is 15.00 PhP (.30$). There are other sites in the province of Bohol that are on the tentative list: Baclayon Church (under the inscription Jesuit churches of the Philippines, although this has been the supposed 5th church in the Baroque Churches series but wasn't accepted) and Panglao Island. AWESOME!!! It is a sight to behold. I just can't imagine how those hills were formed. You guys should check this one out, it really rocks. The road leading to the place is very nice also (kudos to the city goverment). One of the best place to be. Hail Tagbilaran! !